Carpenter ants, vary in size and color but are usually large (1/4-1/2 inch) and blackish. Occasionally, swarms of winged carpenter ant reproductives will emerge inside a home. Carpenter ant swarms usually occur in the spring and are a sure sign that a colony is nesting somewhere inside the structure. Winged carpenter ants can be distinguished from termites by their larger size and shape of their antennae, waist and wings. Besides being objectionable by their presence, carpenter ants damage wood by hollowing it out for nesting. They excavate galleries in wood which have a smooth, sandpapered appearance. Wood which has been damaged by carpenter ants contains no mud-like material, as is the case with termites. Shredded fragments of wood, similar in appearance to coarse sawdust, are ejected from the galleries through preexisting cracks or slits made by the ants. When such accumulations are found (typically containing dead ants and bits of insects which the carpenter ants have eaten), it is a good indication that a carpenter ant nest is nearby. Oftentimes, however, the excavated sawdust remains hidden behind a wall or in some other concealed area. If you have a carpenter ant infestation, what you need is an exterminator who will locate the nest location(s) and eliminate all the ants. They are well trained in locating their nesting location and terminating the colony. Ant colonies can be enormous. Their colonies can number up to 300,000-500,000. They can basically invade your home or office through any crack or hole. Your lawn, walls, stumps, and under your foundation, are perfect nesting spots for ants. Generally, they are seeking sweet or greasy food, or water, so closing lids, and cleaning up messes can help reduce the problem. 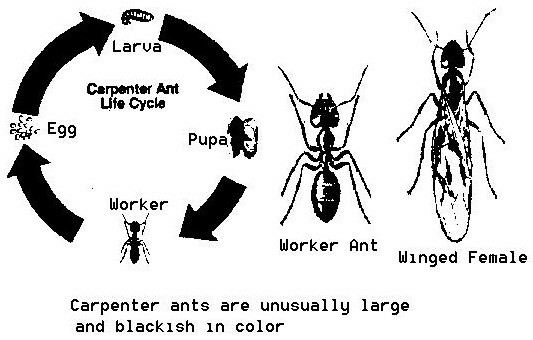 There are many different “castes”, or types, of Carpenter Ants, such as the queen, workers and males. Since any of these three castes of Carpenter Ants look differently from one another, and many of these ants look and act similarly to termites and some other types of ants, it is imperative to seek professional help when identifying and removing the ant infestation. Different species require different treatments. What you need is an exterminator who will locate the nest location(s) and eliminate all the ants. If you think you may have a Carpenter Ant problem, call a pest control professional today!